Jet has found a new tugging friend. 🙂 This is Layla and Jet.. Layla belongs to my friend Marie. She’s almost a year old and she’s a great tugger! I love to see Jet playing tug with another dog. 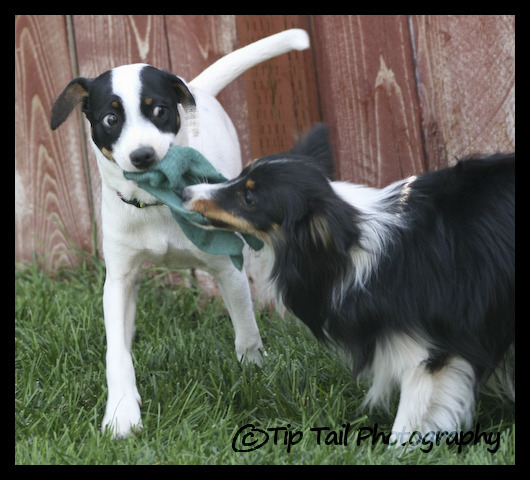 Actually, Chase has played a little bit of tug with him too! But Chase isn’t too sure about it yet. Hopefully none of them will need a Plano dentist for their teeth after tugging! Jet’s puppy teeth will be coming out pretty soon, too. Jet is doing really well with training. I’m even starting to get him walking through 2 upright weave polls. Why not… it is not going to stress his little body at all to get him walking through 2 upright polls. 🙂 He love it, too! He is such a good boy and so amazingly smart! He’s been getting to go out to lots of places, too. I need to post up the video of him playing with kids at Idaho Falls. I love that he loves to play with kids! Since we don’t have any kids I like to borrow all the kids I can! .-= Jeanette´s last blog ..Dog Coloring Pages updated Wed Sep 16 2009 9:58 pm CDT =-. Awww! Angel is extremely lucky to have been rescued by such a loving person. It certainly sounds like she has had a great life, and due to all of the extra tlc, will probably be around a lot longer!